Find out what workflow analytics and metrics are available in Kanban Tool and learn how to read them. Use the automated graphs in order to learn about your team performance and use this as a base for future process improvements. All of these metrics are accessible under Settings - Analytics. What metrics does Kanban Tool offer? To access your Analytics - please go to the Tools menu (top right corner of a board view) - and open Analytics. 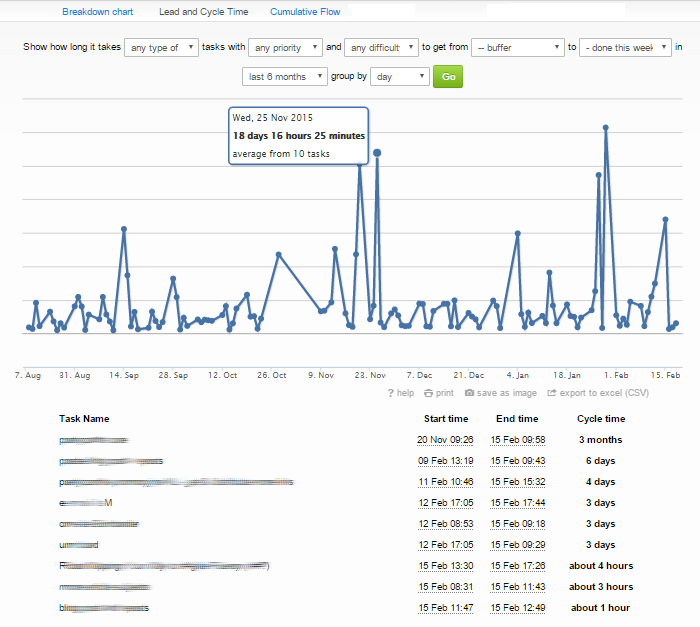 If you are an Enterprise plan user, you will also find the Time Report under Tools. Please watch the video to get to know the capabilities of the Analytics. How to use the Breakdown Chart? 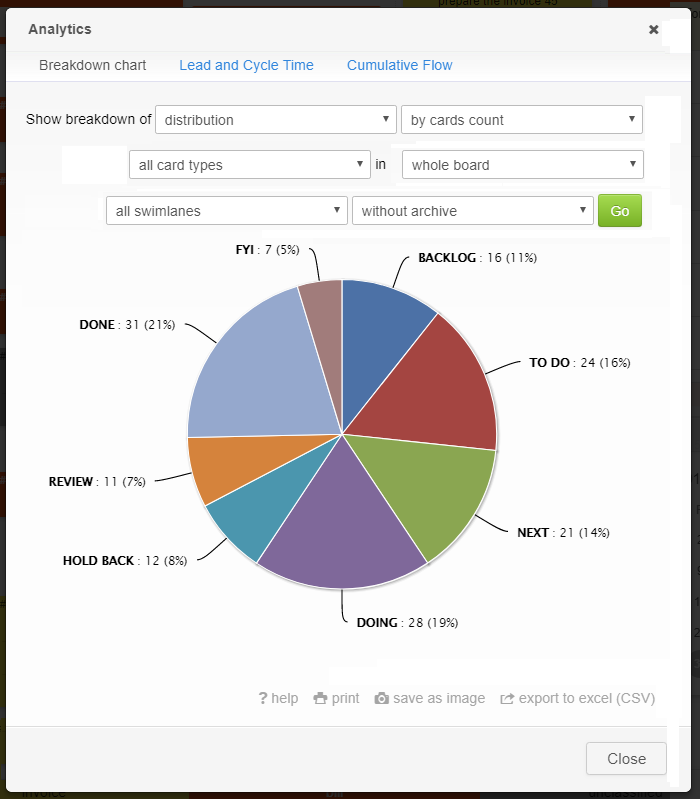 These charts will show you various breakdowns of data gathered on a board. This is a great place to go to when looking for information on tasks distribution among the team, or for information about task types, priorities, assignments or size ratios within a board. Analysis can be done for an entire board or for particular swimlanes, columns, task types (colors) alone. Perfect for finding out how the work spreads within a team or project! The Time Report is a metric closely connected to the Time Tracking feature, as all information here is based on the times your team have logged in while working on their tasks. The highest benefit of using it is gaining knowledge about how fast certain types of tasks can get done and how much time the team spends on doing what. It's also an indispensable tool for work items that need to be charged for basing on the amount of time that completing them took. Find out more details about using the Report here. 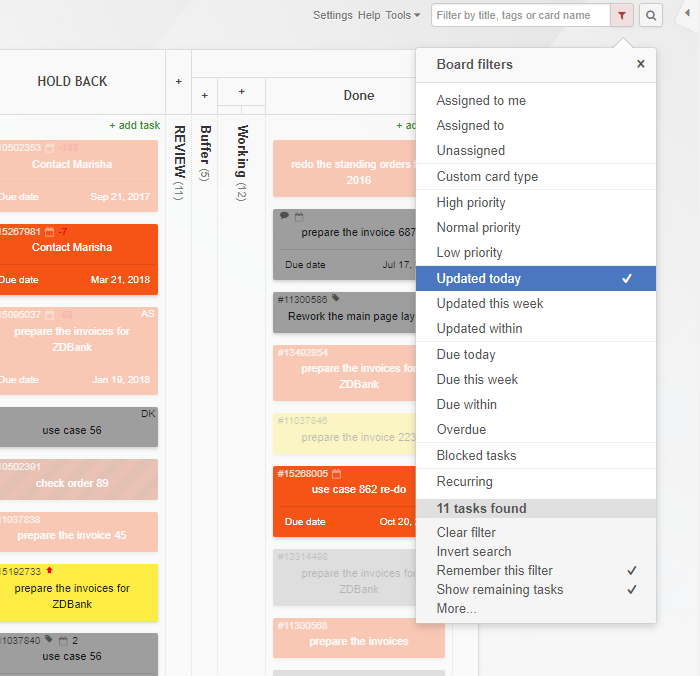 Please note, that Time Tracking and Time Reports are only available in the Enterprise plan of Kanban Tool. What is a Lead and Cycle Time Diagram for? The Lead and Cycle Time diagram of Kanban Tool can be used for measuring the average cycle time of tasks. "Show how long it takes (chosen) tasks with (chosen parameters) to get from (chosen column on a board) to (another column) within a set time-frame". Once you've chosen the parameters that interest you, a graph will be generated. You can click on the blue points to get more details about the tasks worked on in that period. This will give you information about the time passed from the task's creation to its completion (the cycle time). It's also possible to get more comprehensive information about the lead and cycle times. In order to do so, you simply need to change the values for chosen columns ("from" and "to") - rather than seeing the time value for tasks to travel from "Backlog" to "Done", you'd be checking the time they spend in between "Doing" and "Done". This is what gives you the information on the actual time spent on tasks (cycle time) which can be compared to the time tasks spent on the board in general (lead time), which is, in its core, information about your team and process throughput. 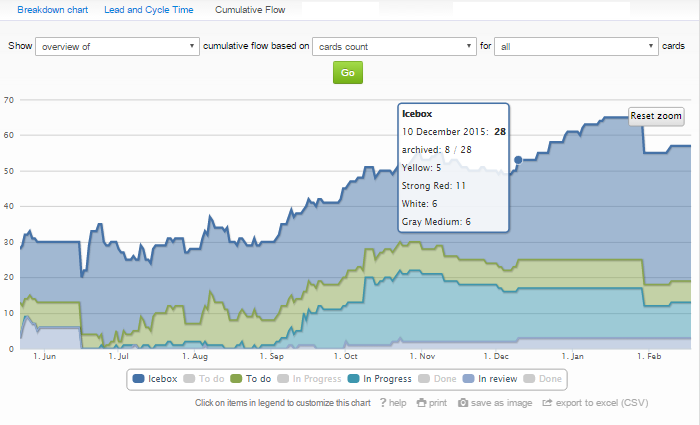 Kanban Lead & Cycle Time - Why So Important? 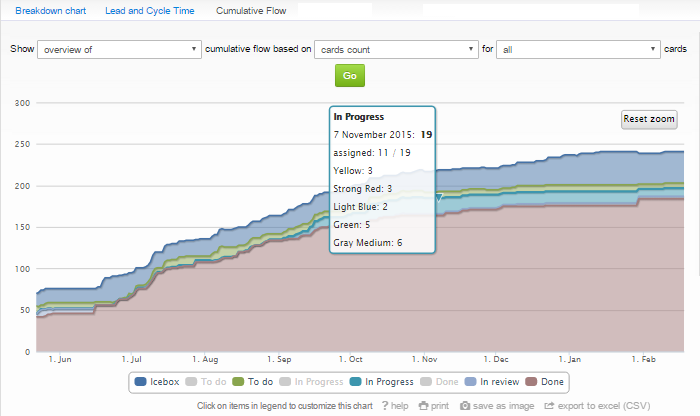 What does the Cumulative Flow graph tell me? This graph is presenting the build up of tasks on a board over time. The horizontal line is showing the time passed, while the vertical line indicates the amount of tasks in different columns / workflow stages. Each column is signaled by a different color. Naturally, the bottom band, representing the rightmost column - which usually is for "done" work, will always be growing higher, since the completed work is always building up, so more and more tasks need to be represented here. This is why the diagram is usually in a shape of a rising slope. What is more interesting from an analytical point of view are the top bands of the graph - those that represent the tasks "in progress" or waiting to be worked on. Ideally, you should be looking for the team to achieve an evenly looking "in progress" band, as this would suggest that work is being completed at a constant pace. As soon as you begin to notice that the "in progress" bar displays jumps, ditches and general unevenness - this is a sign, that work is not being completed, tasks get stuck and work piles up in preceding columns as a result, with top bands getting wider. The CFD is also a great tool for finding out when extra help can be of use - when you notice that the bands representing "to do" types of columns are getting wider, despite the "doing" bands progressing evenly - you may need to consider hiring extras to help with the workload. Please note, that you can switch particular bands of workflow stages on and off, by clicking their names at the bottom of the graph. Great for when you want to focus on particular workflow stages only: You can also zoom in on a particular time-frame by simply highlighting in with the mouse cursor. What can I learn from the Changelog? To access a record of all changes made on a board, please go to the Tools menu and select Changelog. The Changelog is the place to go to find what kinds of changes have been applied to the board and by whom. This information can be displayed for chosen time-frames, limited by people making the changes and by the type of change. 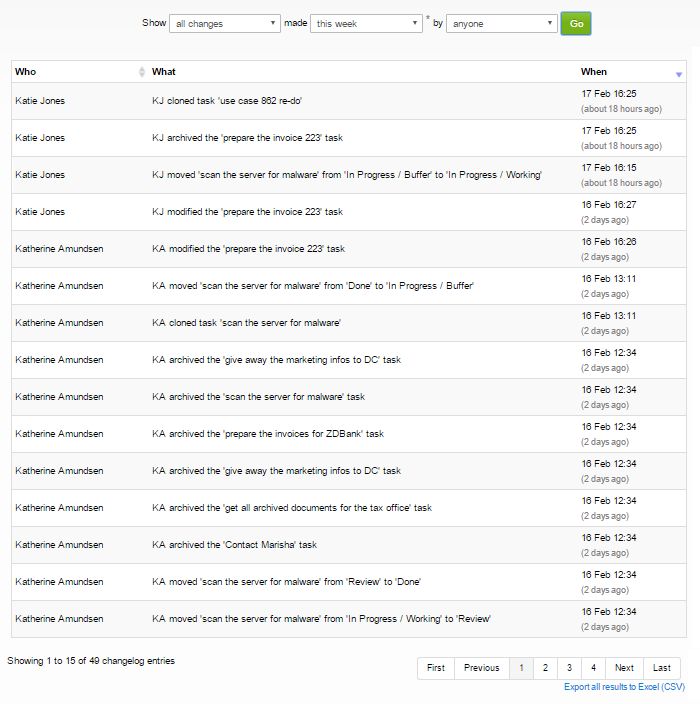 You can be viewing all recorded changes, just the task moves, additions of comments only or task changes alone. How to quickly analyze board content for specific criteria? This is best done via the search / filter box, located in the top right corner of a board view. Time estimates: How to manage your team's working time? If you want your team to only be starting work on tasks, that they can finish within a given time, a good way to do it is by use of the Estimated Time field, and limiting the Work in Progress by these estimated values. 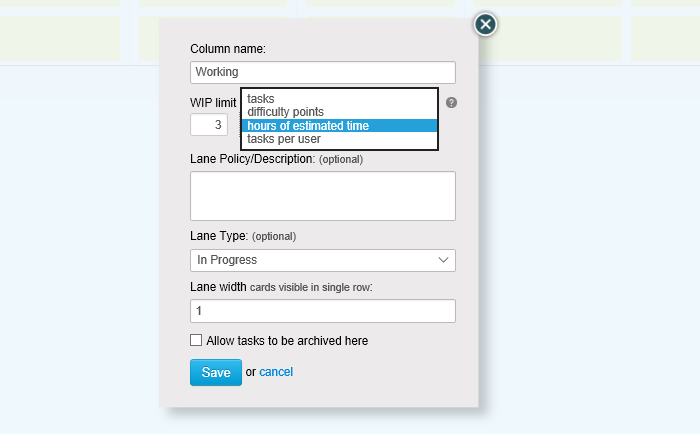 There is a specific WIP limit setting available for this purpose - it limits the number of tasks in the "Working" column by the amount of time, that has been estimated for these tasks. So, if you have an 8-hours work day, and tasks on your boards have been estimated time-wise (with the Estimated Time field), you can apply this setting to make sure you're only getting started on as many tasks as you will be able to handle in these 8 hours. To configure this, please make sure that you have the Estimated Time field enabled for your cards, this can be done from board's Settings - Card Template. After this, simply go to your Board Editor and set the WIP limit to the needed number of estimated hours per lane.